Gardening insights, ideas, and practical advice. I’ve been waiting all winter for this. Finally, a garden salad! 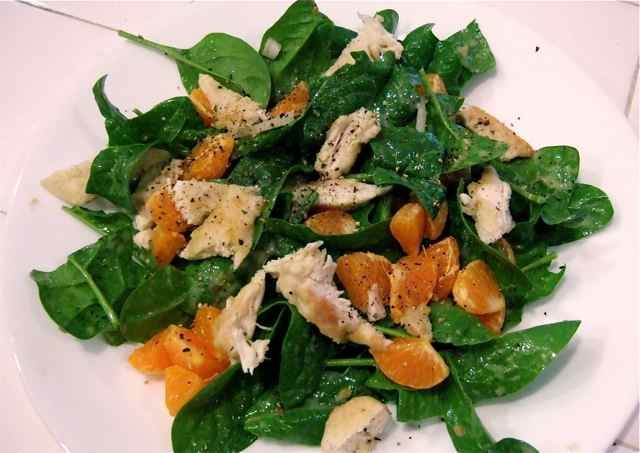 Young spinach leaves and sweet onion, a clementine and a quarter chicken breast, braised, sprinkled with fresh lemon, tossed with Annie’s Goddess dressing, and topped with ground pepper. What could be better? Lately I’ve been too busy to enjoy food. It’s spring, for one thing. And I’m moving next week, for another. Fuel, I think, I need fuel to keep this machine running. I throw together a pita pizza or a tired salad made from supermarket romaine, or I grab a package of Wegman’s sushi. As I eat, hastily, my mind is elsewhere. I am envisioning the “living tennis garden” that will span the centuries (and attract big donors) for a historic garden client, or mentally sorting through the rolls of speaker wire and boxes of dried up crayola markers that I’ve dragged through the decades. Nervous energy requires ice cream, and gardening burns calories, so I indulge as I collapse on my easy chair at night to watch a mindless hospital show rerun or predictable crime drama. Ice cream is a “no-fail” satisfier. But it’s been a long time since I’ve had REAL greens, and ice cream after a fresh salad would taste oh so much better. But my spinach will not be rushed. It puts on another set of leaves. So painstakingly slowly the leaves grow! I’m moving, I growl. Can’t you just speed it up a little I ask (nicely) as I cut a couple of the little leaves to add to my supermarket romaine? It crinkles its veins. Yesterday morning I assessed, and determined that my little row of overwintered spinach would be sufficient for one salad. And I have to say it was one stupendous salad. The best, and probably the last from this particular plot of ground. I stole four seedlings of Loma lettuce from my buyers garden (already I think of myself as the caretaker for their plants), which had sprung from the seeds I scattered last fall, and potted them. I had no choice really. By the time I pack up my speaker wire and leave my scented Daphne and viridiflora tulips behind, Loma will still be mercilessly unyielding. And that is just not acceptable. 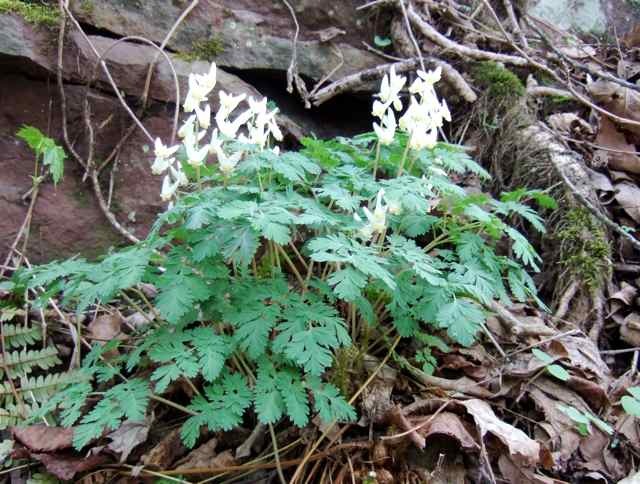 Dicentra cucullaria (Dutchman’s breeches), more than any other flower, speaks to me about time. 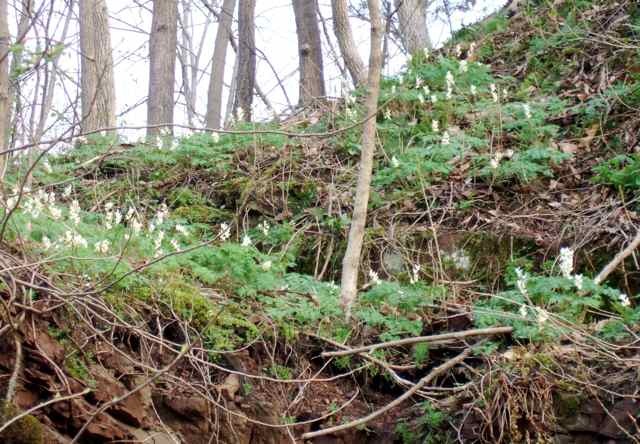 Sometime in early April it appears on the rugged rocky slopes that rim the Delaware River on the Pennsylvania side. It flags me from an elevated ledge, or an almost vertical incline covered with a scant inch or two of mossy soil, and I think of years past. A dozen years ago it was a symbol for the exhilaration of being set free from my job in a tax office. Decades before that it was a curious tooth-like childhood curiosity. The first warm day of spring I begin skimming the hills in anticipation. When will it appear? How long will it stay? A burst of unseasonal hotness might cause it to disappear just a week or two after blooming, beneath fiddleheads and grasses and jewelweed seedlings. Or it might cling to the hills for three whole weeks. The queen bumblebee emerges from her hole in the ground and finds the odd-shaped flowers just right for her long tongue. After she pollinates, the flowers become seeds with tasty appendages that ants find so irresistible that they carry them away to their nests, leaving trails of the fertile seeds strewn on the forest floor. I’ve thought about transplanting a clump of Dutchman’s breeches into my garden, but fear that it would spoil the fun. Such a delicate thing should grow in great wild expanses where it can present an ephemeral banquet to queen bees, and to those of us who care enough to notice. Its time to shine, between snow cover and leaf emergence, is fleeting—it flaunts its breeches, than vanishes for another year until April comes again. Another year of driving to New Jersey. Another year of planting zinnias and tomatoes, and watching grandchildren grow taller. Another year of resolving to focus on what’s important in this life that passes so astonishingly quickly. Gardens are my livelihood; nature my entertainment. Over the years I’ve managed vegetable and flower test gardens for Organic Gardening magazine, and planned appropriately historic flower gardens for Morven Museum in Princeton, New Jersey. I’ve kept the beautiful Glasbern Inn property in Fogelsville, Pennsylvania blooming for many summers, and now grow vegetables for the inn's authentic farm-to-table restaurant. Relatively late in life, I acquired a BS in Horticulture. Later yet, an MS in Environmental Science. But my real education has come from the garden--every day I learn something new. In this space I'll share discoveries and insights. Note: I was recently quoted in the New York Times! Check out "Ergonomic Tools that Prune Away Gardening Pains"